Furthermore, what if we don’t mind laughing even about some things we agree with? Both Colbert and Stewart make fun of some of my own political views. I was thinking of saying that I like them in spite of this; it might be more accurate to say that I like them, at least in part, not in spite of this but because of it — because I don’t want to live in a country where people can’t laugh at themselves, and where everybody takes himself and his own opinions as seriously as the Baffler guy seems to. 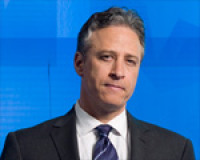 Unlike Rush Limbaugh on the right or Michael Moore on the left, Stewart is a likeable guy. There’s an Everyman quality about him, although he no doubt is in the same tax bracket as Limbaugh and Moore. He also reminds me of the business adage that you should be grateful for your competitors, because they help find the flaws in your products.